Click the button below to add the Panther Weekender Solar Water Pumping System 11 Litres per Minute for up to 6 hours per day to your wish list. The very popular "Panther" is the small to medium "Weekender" solar powered water pumping systems and is designed to provide a water flow rate up to 11 litres per minute at a constant pressure of 210 kPa for a maximum of 6 hours per day. This is sufficient pressure for a shower, washing machine, dishwasher and most on-demand gas hot water services. A flow of 11 litres per minute is terrific for a single shower but really nothing else at the same time. The "Panther" is sized for a small to medium demand and is suitable for a weekender for one to six people. The "Panther" is sized for a 100 A/hour battery with a 150w 12v panel receiving 4-6 hours of sunlight per day, less sunlight per day will reduce the number of pumping hours per day.The "Panther" will pump water from any above ground rainwater tank into the cabin or weekender at a variable flow rate and at a constant pressure of 210 kPa. This pressure is usually more than ample for a good shower. The other benefit of the unit is that as the pump is a variable speed drive, it speeds up in response to an increase in flow demand. What this really means is that if you only turn on the tap a little bit, the pump will be running at less than half speed, as you open the tap further, the flow demand increases and, the pump speed increases. This pump provides a constant pressure and will turn off automatically when you turn off the tap. The "Panther" is definitely recommended for a weekender or cabin where 4 - 6 people will be staying as, the pumping system, solar panel and battery have been sized for a maximum of 6 hours of pump operation per day. If you use the pump for more than 6 hours a day, you will be drawing excessive power from the battery and if the battery level falls too far, the controller will stop power to the pump. 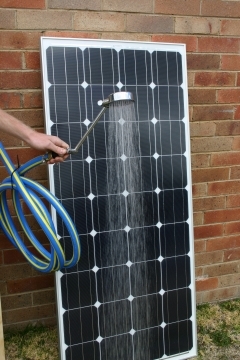 The power figures are based on the solar panel receiving 6 hours of full sunlight every day, the 150w 12v solar panel comes with a steel post and mounting frame so that you can install the solar panel in the sun facing North, or, you can of course mount the panel on the roof with some additional items. 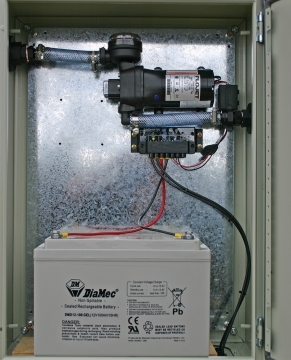 Click here for the tech specs for the Flojet VFD pump. Pump, regulator and battery pre-wired and tested, panel solar wiring connected and tested.